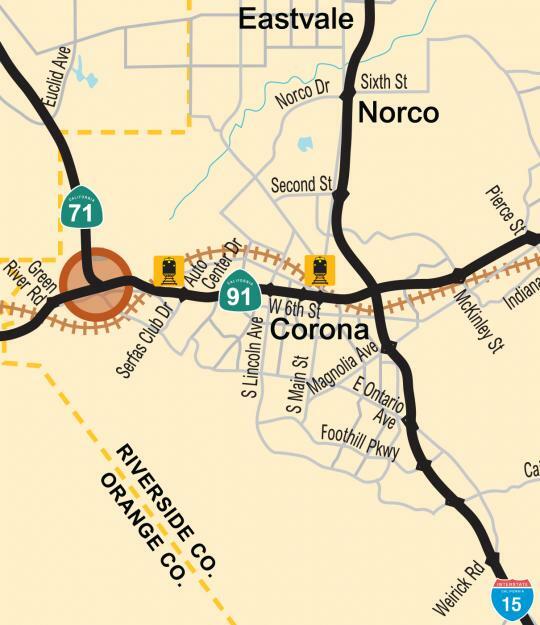 Construct a two-lane direct flyover connector from eastbound State Route 91 to northbound State Route 71. Improve connection between the eastbound 91 Green River Road on-ramp and the 71/91 Interchange. Construct an eastbound road south and parallel to SR-91 between Green River Road and the 71/91 Interchange. RCTC has completed the project approval process and has received gas tax funds from SB 1 to revalidate the environmental studies. This estimated $118 million project is a major element of RCTC’s 10-year Measure A delivery plan and a high priority within the region; however, there is currently not sufficient funding to construct the project. RCTC is pursuing a federal grant to fund construction. 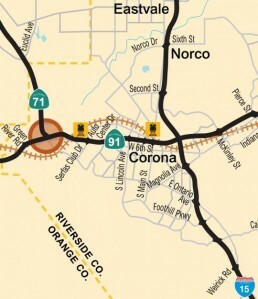 The 71/91 Interchange is a significant source of traffic congestion in the area, and this project is designed to reduce congestion, enhance safety of motorists, support movement of goods, and improve mobility and connections between State Route 71 and State Route 91 and among the counties of Riverside, San Bernardino and Orange. Build a new, separate eastbound road just south of and parallel to SR-91 to provide improved access between the Green River Road interchange and the SR-91/SR-71 interchange.